Marita's older sister is turning 50 in a couple of weeks. 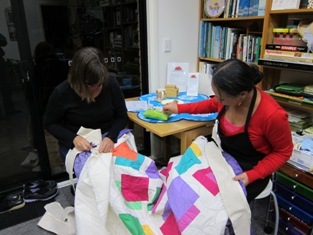 She made her version of the 'Colour Play' quilt top. 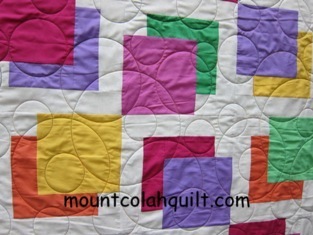 I quilted it last night on my wonderful Gammill Statler. Marita chose the pattern, '2475 totally mod circles e2e', by Tammy Finkler, for her quilt. I picked the variegated Signature 100% cotton thread, Tie Dye, for the quilting. 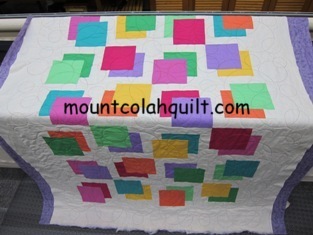 It quilted nicely and showed off the quilting pattern on the backing beautifully. Marita was around to help out where she could. I was telling her what to do, for a change. But, of course, I don't think she would agree with this.!!! We had fun, nevertheless. 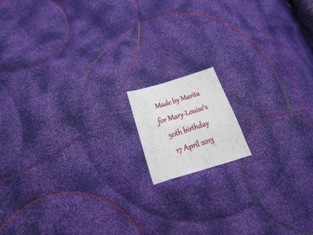 :-) I hope the quilt would be well received by Marita's sister.